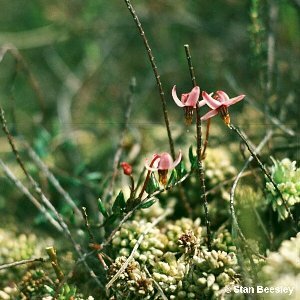 This prostrate, woody plant has tiny oval pointed leaves on long, trailing stems and is rather frequent on bogs. The flower is pink with the petals bent backwards and the pale edible fruit (cranberry) is red or brown-spotted. This is the native European species: it should not be confused with the American Vaccinium macrocarpon, a cultivated species which is the source of commercial cranberry sauce and juice. 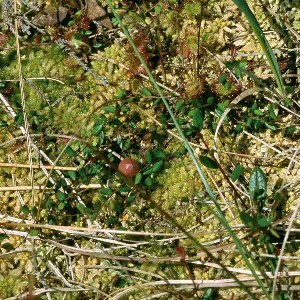 All names: Vaccinium oxycoccos L.; Oxycoccos palustris Pers. ; Oxycoccos quadripetalus Gilib. ; Oxycoccos oxycoccos (L.) MacMill.